After the ride that was Ninefox Gambit, a reader could be asked how to top that. It’s a question of sequels, and one that often has a disappointing answer. 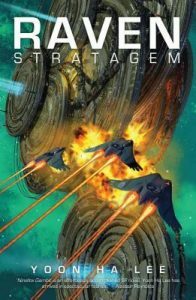 In Raven Stratagem, Yoon Ha Lee shows that they can work. Taking place shortly after the events of the previous volume – one I suggest people go to – the action moves as a ghost of infamous general, the fleet he hijacks, the empire that rules them all , and the belief that goes with the imperial calendar. Much of this universe seems based around the concept of the calendar, with conflict often based on the view of a calendar. That’s not to say this is a boring novel. It moves along at a cracking pace, and even after reading the first, still has surprises in it. With empires, large scale battles, military protocols, it ticks all the neccessary ticks for a classic space opera. The writing style is easy to read, yet the concepts are twisted enough to require very careful reading. One of the tropes of modern science fiction is the large interplantary empire. From Asimov’s Foundation, to Lucas’s Star Wars, the Empire and its machinations is one of the cogs that have helped keep the genre going. It is also one of the reasons why the large Empire falling has become a bit of a cliche as well. 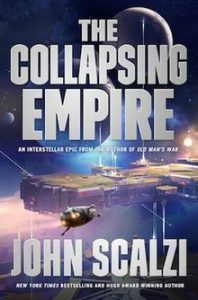 With a name like The Collapsing Empire, you might be inclined to be a little disappointed with John Scalzi. After reading this novel, you won’t be. The biggest problem that the large space empire always faces is distance. Scalzi puts forward the idea of the flow, which appear to be a one way worm hole. Power in the empire is at the nexus of these “Flows”. It is from here that Scalzi begins a fast paced story of unexpected leaders, disasterous events, and political intrigues. Each chapter is told from one character’s point of view, with all told with a distinctive voice and attitude. This is clearly the open salvo in a series that promises many surprises, fast paced action, and a few laugh out loud moments. Two brothers jointly owned a business and both were wise in worldly ways. While dying, one brother instructed his sibling to put half of their combined wealth into the grave with the casket. In time his brother died. At the graveside ceremony the living brother wrote a cheque for half of their assets and placed it in the casket. George had responded to a call from his solitors, insisting that they meet at once. He arrived at his lawyer’s firm, and was ushered into his office. “Do you want the bad news first or the terrible news?” the lawyer asked. “Well, if those are my choices, I guess I’ll take the bad news first”. “Your wife found a picture worth a half-million dollars”. “That’s the bad news?” George was stunned? “If you call that bad, I can’t wait to hear the terrible news”. “The terrible news is that it’s of you and your secretary”. Can you believe it’s been 5 months since we last had an episode? We can believe it, as we’re lazy buggers, but we’re finally back with an episode dedicated to the new POTUS. – We talk Trump – lots of Trump – with some non-confected disagreement even! Don’t forget we’d love your feedback via the website, Twitter or Facebook. You can find out how to subscribe to this podcast on iTunes, Google Play Music or Stitcher here. We also publish the podcasts on YouTube. When her husband passed away, the wife put the usual death notice in the newspaper, but added that he had died of gonorrhoea. “You know very well that he died of diarrhoea, not gonorrhoea”. The engineer said “In the neighbourhood of $125,000 a year, depending on the benefits package”. And the interviewer replied “Yeah, but you started it”. Two friends were standing in a bank when a pair of robbers entered. Not only did the thieves clean out the cash registers, but they walked around with bags and ordered everyone to throw their valuables in. Just as the robbers got to the pair, one of the friends turned to the other and, passing him a bill, said “By the way, Joe, here’s that twenty bucks I owe you”. Neil Gaiman is one of those authors that can make any other writer can blanch when comparing their own work with his. From novels and comic books, to even writing screenplay adaptations, he is a highly accomplished author and it would be no surprise if even more of his work was adapted into TV and film in the coming year – I’m already counting the days until American Gods premieres. I’m breaking into a sweat even thinking about writing a review of of anything Gaiman has written – let alone a book collecting amongst other things his own reviews of other people’s work. 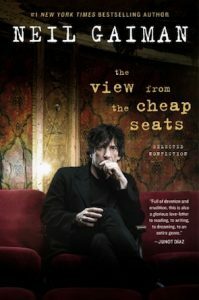 The View from the Cheap Seats is a typical Gaiman creation in that there’s a lot more to it than is evident on a quick peruse. This is one of those collections that you won’t necessarily want to read from from to back in one sitting, and nor do you need to given the varied content broken up into discreet sections. There are reviews of movies, discussions on relationships with other authors and artists, thoughts on science fiction and comics. For mine, the first section is one of the best: thoughts on the importance of libraries, bookshops and Halloween to name three topics. That said, Gaiman’s ability to engage works equally as well in the non-fiction realm and I haven’t been tempted to skip chapters on topics of little interest. If you’re after a book of essays that are written with skill and passion, then definitely give The View From The Cheap Seats a go. If you’re looking for wild fantasy you won’t find it, but in its place you’ll fine something equally as satisfying. The Magic Circle - is not so helpful, actually.